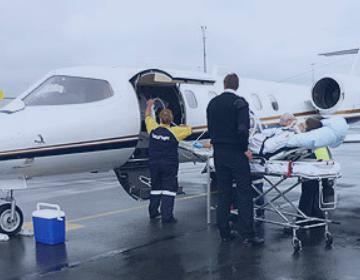 Air Ambulance service provides timely and efficient movement and en route care provided by medical personnel to the wounded being evacuated from the remote location to major medical facilities using medically equipped Aircraft (air ambulance). Accretion Aviation intends to provide air ambulance services and Advanced Medical Critical Care to the patients on an Emergency basis 24x7, 365 days a year resulting from trauma, mass disasters, and various advanced medical problems. Our air ambulances can land on smallest of airstrips and can facilitate patient and attendants to be transferred quickly to larger medical facilities in cities like Mumbai, Delhi, Kolkata or Chennai. A Doctor/Nurse accompanying the patient from "bedside to bedside" throughout the transfer. Ground transport for the patient. Special assistance at the airport for speedy and comfortable boarding. Arrangement of portable life saving equipments like defibrillators , ventilators , infusion pumps , spine board , balloon pumps , pacemakers , monitors , oxygen cylinders, stretchers and other special requirements in the aircraft. Administering patient medication, monitoring and nursing care on board the flight. We use the latest "State- of- the- art" equipment that can provide ICU care . 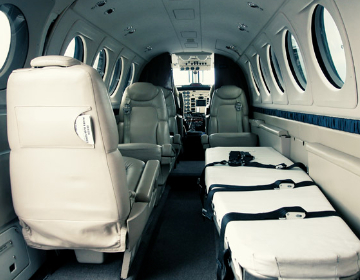 Though a patient may only require minimal care, the air ambulance always has standard emergency equipment and medication.